Had to be alert to make a crucial save from Moussa Marega during the first half, reacting quickly with his feet to deny the Porto striker from a highly dangerous position. One nervy moment as he needlessly rushed out towards Virgil Van Dijk in the second half, but fortunately the Dutchman acted decisively to clear the situation. Positioned himself well to make another, more routine stop from Marega in the second half. After being substituted for James Milner for the final half hour against Southampton, Trent produced a similarly mixed display here – highly effective as an attacking force, but several shaky moments defensively. Timed his forward run superbly to put the ball on a plate for Roberto Firmino‘s goal- taking his tally to eight assists for the season- but will have been mightily relieved not to give away a penalty for a potential handball following VAR review (although in truth, he had very little time to react). Made an important clearance at the back post early in the second half just before putting Mohamed Salah through on goal with a clever pass on his weaker foot. Starting for the first time since the FA Cup third round exit to Wolves in early January, Porto clearly targeted Liverpool’s right-hand channel between Trent and Lovren, and at times the Croatian looked slightly off the pace, which was perhaps to be expected given his lack of minutes lately. He did make several important recovery challenges, however, including a perfectly-timed tackle on Marega in the box in the first half. 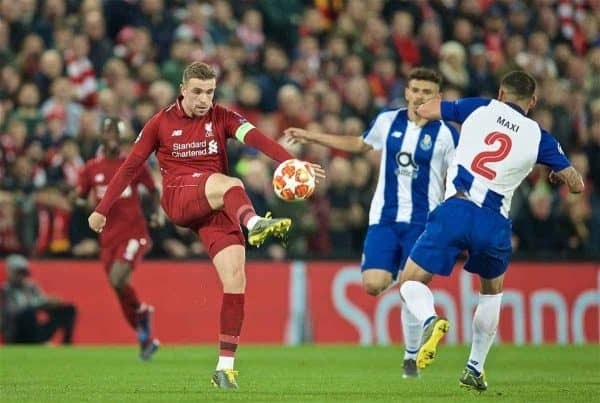 Good defending in stoppage time to get his body in front of the ball as Porto launched a late attack, to help ensure Liverpool preserved their clean sheet. A competent return to the side. As a unit, Liverpool’s defence wasn’t nearly as watertight as it has been for much of the season, but Van Dijk was his usual authoritative self, and like his central defensive partner, also made an excellent challenge on Marega in the first half as the striker found plenty of joy. Swept up calmly when he needed to, and continually sprayed pin-point long-range passes out wide towards Salah to quickly put Liverpool on the attack. Made sure to clear his lines as he nearly collided with Alisson in the second half, and was typically cool whenever called into action as Porto searched for an away goal. The kind of performance it’s easy to take for granted, but only because it’s Virgil. Filling in for the suspended Andy Robertson at left-back, Milner slotted in seamlessly and demonstrated his versatility and experience in the role. Positionally, he made sure he was in the right place to anticipate danger and clear several dangerous crosses, and it was his terrific first-time sweeping pass to Sadio Mane which started the move which led to the opening goal. Aerially strong when defending set pieces, this was an admirable performance from Milner in Robertson’s absence, even if he wasn’t quite as effective in an attacking sense as the Scotsman. After an uncharacteristically ragged display at times against Southampton, Fabinho was much more imposing and controlled here, benefiting from playing with Jordan Henderson slightly further ahead of him. Occasionally a little too casual in possession at times in the first half, the Brazilian grew into the game impressively and started winning several strong challenges, including a well-judged tackle on Yacine Brahimi on the edge of his own box. Got through plenty of valuable but understated work in midfield, winning a free-kick in stoppage time to help run the clock down. A steady showing. Following his decisive cameo performance as he both scored and assisted coming off the bench to change the game against Southampton, Henderson started here in that same more advanced midfield role with license to get forward regularly. His energetic runs repeatedly broke the lines as he looked to link up with the attack, and it was Henderson’s precise through ball to Trent which sliced open Porto’s back line for Liverpool’s second goal. Unfortunate not to get a brilliant assist after picking out Mane with a delightful ball into the box shortly after the break, as the goal was narrowly ruled out for offside. Relentless in his work off the ball, as ever. Followed up his first goal for the club against Southampton by opening his European account here, scoring the opener with the help of a deflection after just five minutes. Creating an excellent chance for Firmino only moments later, Keita visibly grew in confidence, taking players on and dribbling his way out of numerous tight scenarios when under pressure. 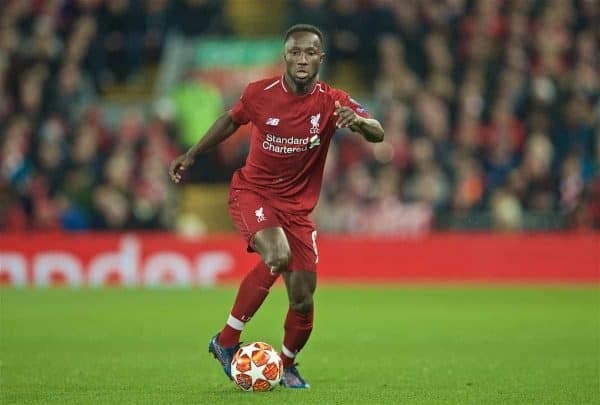 Not afraid to take risks and always looking for the incisive forward pass, Keita also impressed with his work out of possession, imposing himself more physically and winning the ball back efficiently- an aspect he has struggled with at times this season. Another promising step forwards, and further evidence that he can play a significant role in the run-in. Ought to have scored as he was quickest to react to a loose back pass, but shot narrowly wide under pressure from Iker Casillas after being knocked off balance by a heavy challenge. Perpetually involved and trying to make things happen, but his final ball was lacking and he found himself frequently frustrated as his shots and passes were crowded out and blocked by Porto shirts. Can consider himself lucky that his studs-up high challenge on Danilo late on was not punished with a red card, which could have dramatically shifted the balance of the tie. For the second game in a row, the Brazilian showed tremendous awareness and selflessness to pick out a free man in the box as he set up Keita for the opening goal, as he did for Henderson against Southampton. Firmino then bagged his 15th goal of the season, tapping in from Trent’s low cross inside the six-yard box, meaning he has now scored in each of his last three appearances at Anfield. 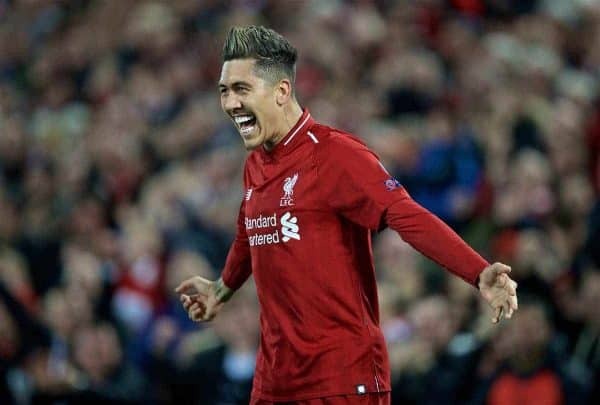 Plenty of silky footwork and slick link-up play, there were clear signs here of Firmino coming into a rich vein of form just at the right time in Liverpool’s season. Played his part in the move which led to Keita’s goal, latching on to Milner’s ball before squaring up his man and slotting the ball into Firmino’s feet. A constant threat and industrious in his pressing, working back well to help out Keita and Milner when necessary, Mane was a touch unfortunate not to get on the scoresheet as his clinical finish from Henderson’s cross was ruled out for a very narrow offside decision. Substituted for Divock Origi for the final 20 minutes, with a view to having him fit and fresh ready for Chelsea on Sunday. Immediately won a free kick with a direct run after coming on, bringing energy and drive down the left-hand channel in the closing stages, using his speed and physicality well. Only a brief cameo appearance, but used his body effectively on a couple of occasions to protect the ball towards the end. Subs not used: Mignolet, Gomez, Matip, Wijnaldum, Shaqiri. Klopp made the sensible decision in giving Gini Wijnaldum a much-needed breather after the Dutchman has looked leggy in recent performances. The manager was rewarded in his team selection as Henderson and Keita thrived in tandem in midfield. Keita delivered arguably his most complete performance for Liverpool so far, scoring again, while utilising Henderson in a more advanced midfield role paid dividends once more, after the captain revealed he had spoken to Klopp recently about what he could offer in this position. 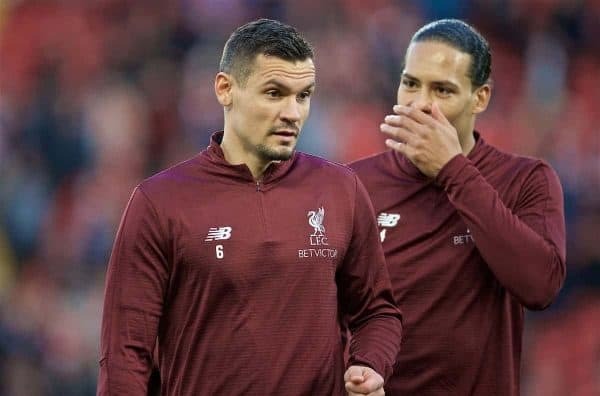 Opting to grant Lovren a rare start, the Croatian generally justified the manager’s decision, giving him plenty of options to choose from against Chelsea in terms of who partners Van Dijk- with Joe Gomez also back in the matchday squad. 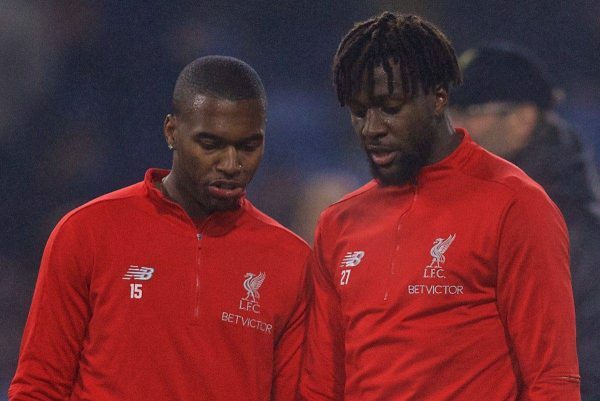 Klopp’s changes to bring on Origi and Sturridge gave Liverpool a slight energy boost in the closing stages up top, while maintaining the stable defensive and midfield structure to preserve a crucial clean sheet. 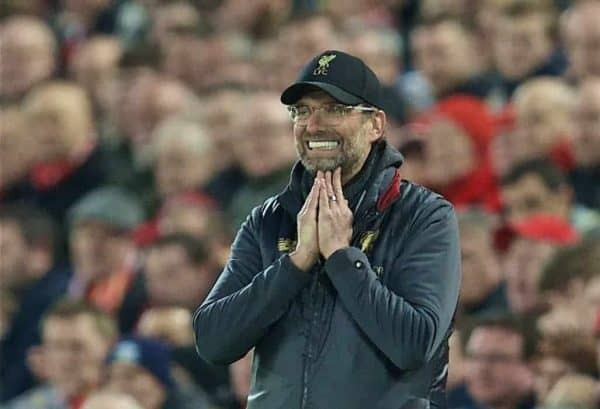 The manager will have been pleased with the way Liverpool managed the game and prevented Porto from scoring an away goal, even if they could have been more ruthless in the final third. 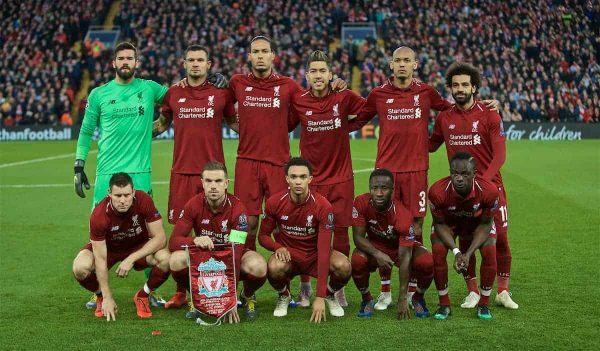 Overall, this was a highly professional first-leg performance which puts Liverpool firmly in control of the tie ahead of the return trip to Portugal.